Poisonous toads: Bermuda toads threaten dogs (blog post) — the toads apparently are now endangered, something the cockroaches/palmetto bugs are probably joyful about as they are one of the things the toads eat. When we lived in Bermuda, the toads were plentiful, but not streetwise. Their corpses, like popped balloons, littered the sides of the roadway. 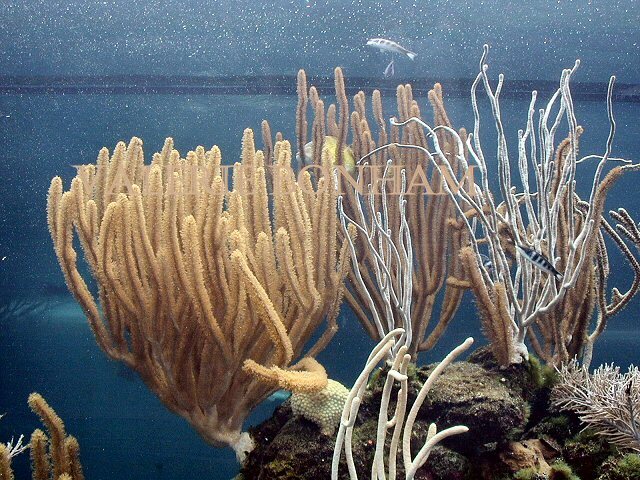 Bermuda Aquarium — My Twitter account background is of a photo of living coral in the Aquarium’s large seawater tank. 2002: Living coral in the Bermuda Aquarium’s tidal tank. The aquarium was a small place, when we lived there, but with real treasure — the Tucker Treasure, something that continued to be plundered as the cross was found, in 1970, to have been stolen and a fake put in its place. It’s never been found. 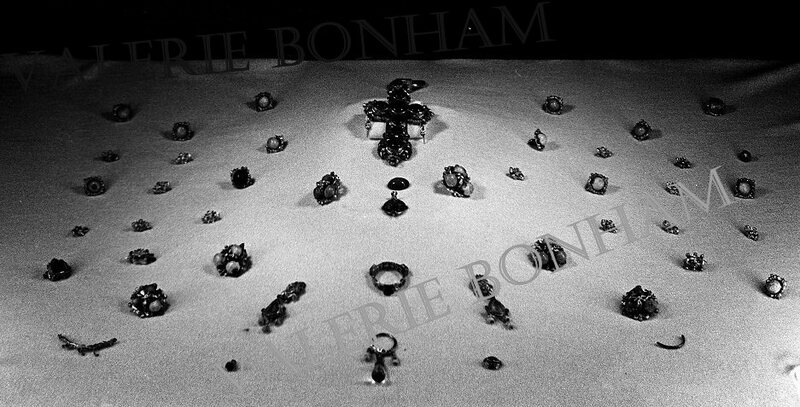 1964: The Tucker Treasure, with the cross that was actually found in the shipwreck. Bermuda Perfumery — what we used to call the Perfume Factory — the fields of Easter lilies smelled divine as we drove past. Smelling lilies now is an instant time-trip for me. Crystal Cave — I remember walking over the bridge floating on the underground seawater lake during a trip to the caves with my Girl Scout troop. 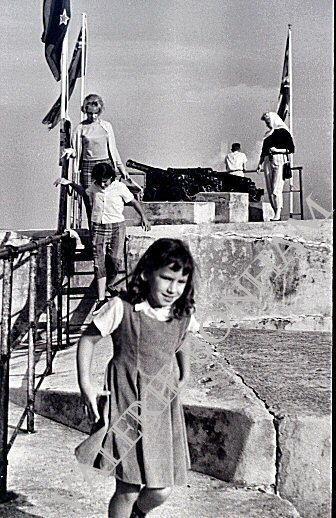 1962: Me and my sister (the two ‘front’ people in the photo — I’m on the steps) at Fort Saint Catherine. Hartley’s Helmet Diving — The Best. Even my non-swimmer husband enjoyed the helmet dive tour. 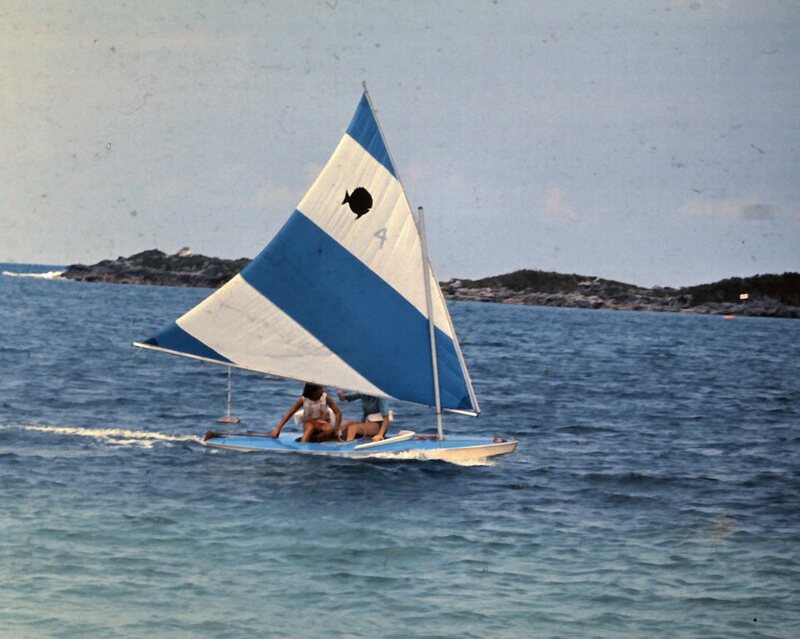 1964: Me holding the tiller during a regatta at the base beach, Clearwater, held for the kids who took a summer sailing class through the Youth Center. Clearwater is the beach where I spent the most time swimming. When I lived there, it was part of the property of Kindley Air Force Base, later a U.S. Naval Station. The ‘beach amenities’ mentioned are the same ones built by the U.S. Air Force for the use of service members and family members. My Girl Scout troop also had campouts on the area on the farther side of the beach. Horseshoe Bay — where a friend and I tried ‘chasing’ angel fish. I’m sure the fish were laughing fish-laughs at the slow, uncoordinated land-spawn. John Smith’s beach — warnings about rip tides are legitimate. One nearly carried me off, but I crawled up the beach, under the water, with the water rushing at me and shoving sand in my mouth. Elbow Beach — too ritzy for the likes of young teens, and, at 20 mph, too far away (at least 10 miles). Shelly Bay beach — a place to collect, what else?, shells. Mom would take us kids out with buckets and she’d use the shells in crafts. Sea Glass beach — a beach I didn’t know about when we lived there. I’d like to visit it when we go back to Bermuda. Tobacco Bay beach — I knew about it, but nobody took me there. Young teens without ‘bikes (ie, motorbikes) are limited in where they can visit. Probably a good thing. Warwick Long Bay beach — another beach that I knew about, but that was too far away. Barritt’s Ginger Beer — apparently a key part of the drink, Dark ‘n Stormy, ginger beer and rum. As I was young, and have never been much of a drinker once I was no longer young, I know only the ginger beer itself (a version of Ginger Ale). 50th anniversary of January 1965 plane crash in Bermuda — one I heard happen. Directory of maps — maps of Bermuda are a special memory for me. Dad gave me one before we moved, and I think I wore holes in the creases where it folded, staring at it before we moved, memorizing the parishes, as if I could absorb its mysteries by gazing. 2002: Photo-map of the islands that make up Bermuda, taken at the Bermuda Aquarium.